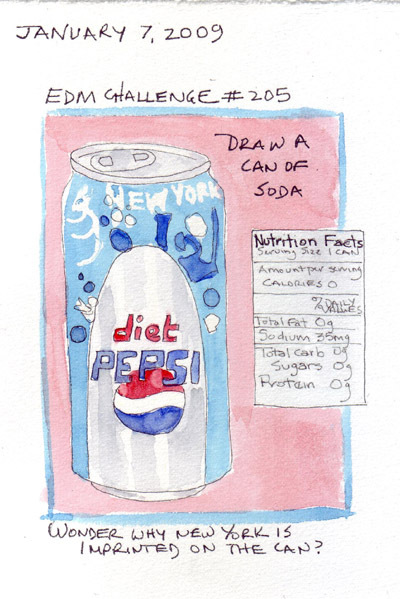 I usually drink Diet Coke from bottles, but painted the soda can that I could find. I'm fascinated with the bold words "New York" which appear several times around the rim. Do cans sold in other cities have a city-specific name? We spent almost 4 months in the UK, in the aggregate, the year my daughter and her family lived in London. I was always learning new words for objects, but these remain among my favorites because the British word connotes something entirely different in America. In the summer 0f 2007, we saw an exhibit of Leon Kossoff's drawings at the National Gallery in London. Although I didn't love the style of his Conte drawings, I was fascinated with his method of working as an artist. Kossoff was born in London in 1926 and is a prominent member of the School of London which also includes Lucien Freud. On the exhibit page, there is a link to one of his very rare interviews, actually done in his exhibit space. Kossoff never paints from photos and although he doesn't consider himself accomplished in drawing, he starts every painting with a fresh drawing and then takes his work back to the studio for painting. Since he was a child, he has drawn and redrawn many of the master works at the National Gallery, and in the interview he relays how he gets his inspiration from these drawings and every day wakes up saying that maybe today he'll learn how to draw! I wondered whether drawing and redrawing a masterpiece that speaks to you would lead to some type of magical experience if you were in the presence of the masterpiece and drawing it over many years. So I thought I would try it when I returned to New York and the Metropolitan Museum of Art. 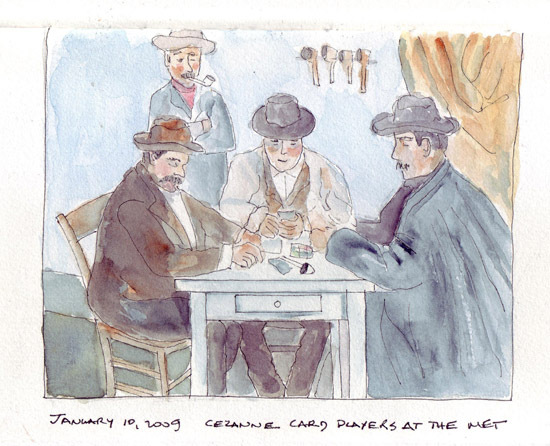 Last January I selected Cezanne's Card Players which I have always admired. It is prominently placed in the 19C galleries and actually has one of the few gallery benches in front of it in the middle of the room. Using watercolors, instead of oils, was a challenge, but I really wanted my work to be more than just an ink or Conte drawing. Yesterday I arrived at the Met when it opened and had 45 minutes during which I was completely alone drawing the Card Players in one of the 19th C. galleries. The Met allows pencils, but not pens or paints, so like Kossoff, I returned home to finish it. But I wanted to try to reproduce the colors, and worked from a photo that I took. Cezanne made 5 Card Player paintings. The first one has 5 figures and is part of the Barnes Collection in Philadelphia. The Met has the second one which was painted in 1890-92. - which has 4 figures. The remaining 3 all have two figures. I also thought that it might be fun to see how my style or skills change over the years - so far not much to my eye. But I wonder whether next year I might decide not to draw in ink, or perhaps to change the colors, or even to move to more of an abstraction. In the interview, Kossoff tells how he once went home from a National Gallery drawing session, and just painted the Rembrandt painting using his own style, without a predrawing on the canvas. He has no idea why his mind just wanted to do that! 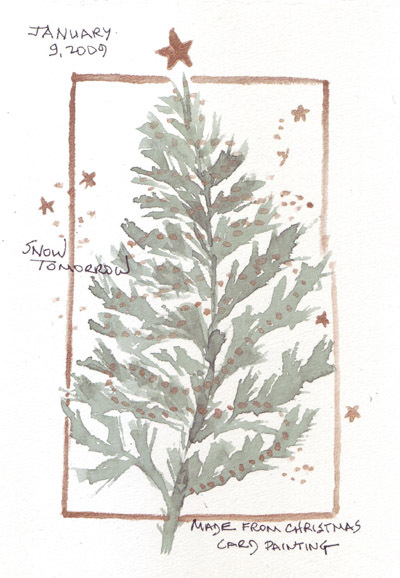 I continued to paint Christmas trees this year throughout the holiday season - and now post #3 and 4 from my journal. I was disappointed to find that watercolor paint is absorbed so rapidly into Fabriano 140lb soft press paper that adding salt immediately didn't allow me to get a snow effect on a painted tree. 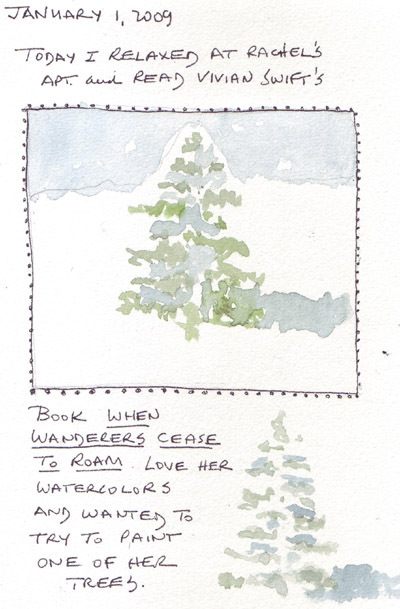 However, I read all of Vivian Swift's book When Wandrers Cease to Roam on New Year's Day, and was inspired to use her watercolor technique to paint a small tree with the suggestion of snow. Yesterday I was putting Christmas cards away and found another painted tree which inspired me to paint #4 in my daily journal, with a healthy amount of gold metallic acrylic paint added for a string of beads and stars. It is currently snowing in Manhattan, and there are Christmas trees propped up against trees in front of our apartment waiting to be picked up for the City mulching program. They already have a wonderful layer of snow on their branches, giving me many trees to paint tonight if I want to bundle up and go downstairs! 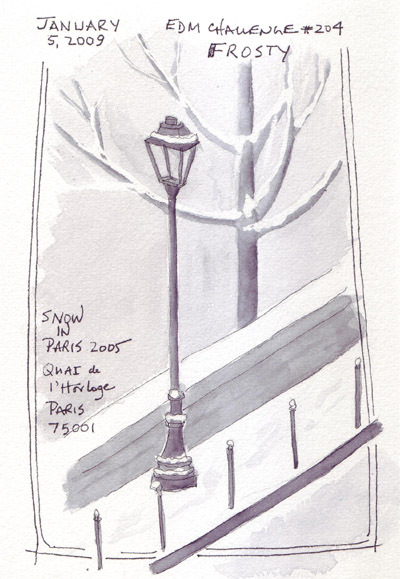 We have had minimal snow in New York City since this challenge was posted, so I went back to photos from a February 2005 trip to Paris. It was the first time we were in Paris in the snow and it was a beautiful site. This drawing was made from a photo that I took from the window of an apartment that we rented on Quai de l'Horloge early in the morning. 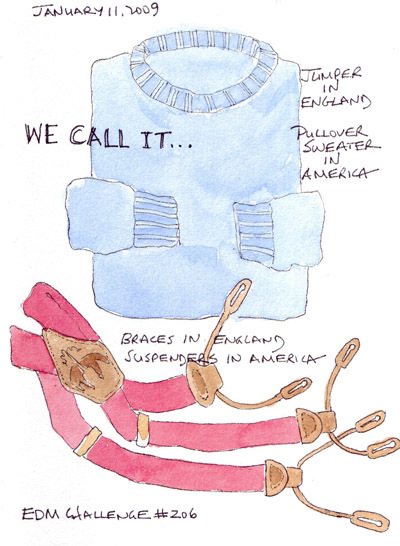 One of my 2009 Art Goals was to finish the pages in my 2nd Figure Drawing Practice watercolor journal. I periodically sketch figures, faces, and hands from photos to obtain some fluency drawing the human body and experimenting with a variety of tools. 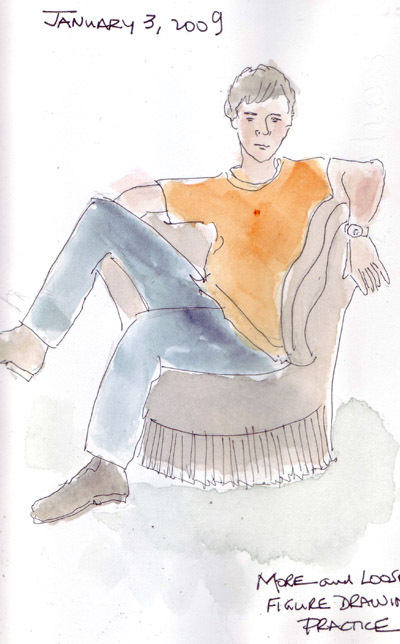 I'm finally willing to put faces on my full figure drawings - a major accomplishment of 2008! Here are two figures that I sketched from photos during this wonderfully relaxing New Year's holiday weekend. The rest of the time I've been reading, quilting, and binding 2 new watercolor journals for the New Year. EDM members inspired me to set goals several years ago and I am grateful for the suggestion. Without them, I'm not sure whether I would have remained as active and productive. So here are my current plans for 2009. 1. Daily Art: Continue to complete one sketch daily, do weekly EDM challenges, and upload some journal pages to my blog at least twice per week. 2. Bookbinding: Make more ~6" x 8" watercolor journals for the year using Fabriano Artistico extra-bright 140 lb soft press paper. a. Faces and figures - try self-portraits? b. Continue to draw the Masters to learn how they make their lines. c. Interiors of my current apartment for the "My Homes" series. a. Redraw and paint Cezanne’s Card Players at the Metropolitan Museum of Art for the second year. b. Finish myThemed Journals: Elizabeth I journal (London) from photos I took there in 2006-7 and my NY State Tax Report journal (New York City) for my 10 blocks from home series of drawings. 5. Retirement Project: I would like to develop a project for my first 6 months of retirement (July-Dec 2009). I love this city and never have enough time to explore it. I need to consider whether I can combine local travel by bus and subway and illustrated journaling of my days exploring specific sections of Manhattan. 7. 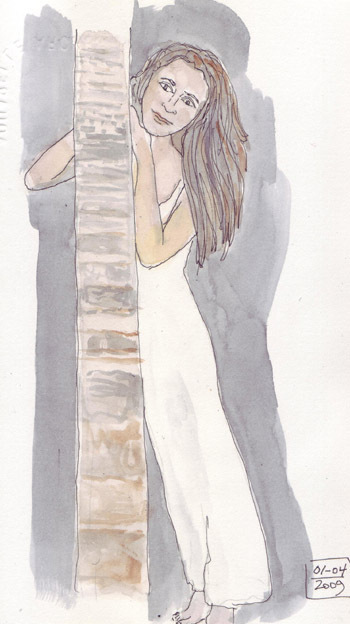 Find a Local Art Buddy: I’d love to have someone to do sketchcrawls with in Manhattan. 8. PLAY: I want to do more experimentation, trying new tools and techniques and loosening up - thinking only of process, not product.